Robeks operates 50+ stores across california and is a 100% franchised system. Robeks is a fruit juice and smoothies chain headquartered in Irvine California. Robeks operates 50+ stores across california and is a 100% franchised system. Robeks came to Amplify looking for a local store marketing solution that would meet the demands of their entrepreneurial franchisees and give them the tools they needed to feel like they were actively supported at the local level. 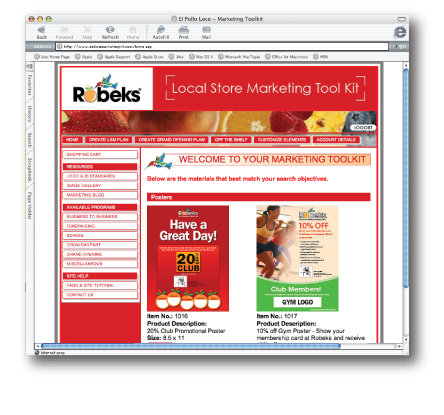 Robeks corporate perpetually found that a lot of their franchisees were running their own local marketing initiatives in store without the consent of the corporate marketing department and with no consideration to brand standards. Knowing that they could not stop this from happening they decided to embrace it and ultimately encourage it as long as franchisees used pre-approved brand standard materials. 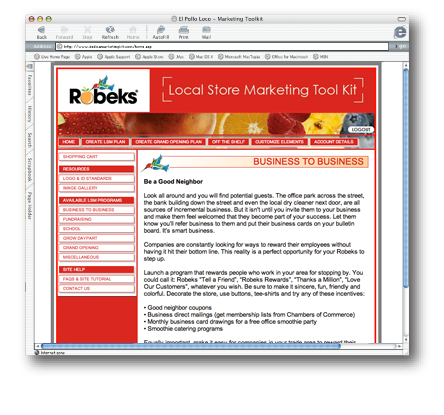 Amplify worked with Robeks to activate the toolkit across their system and ensure that franchisees had a wide enough range of options within the tool to meet their needs. The Robeks franchisees applauded corporates proactive approach and praised them for finally giving them the tools they need to actively market within their local markets.